A recent box office hit, “Crazy Rich Asians,” was played at Rowan for one of February’s Student University Programmers (SUP) events. The film was played in the Student Center Pit and started at 9:30 p.m. “Crazy Rich Asians” features an all-Asian cast and was directed by Jon M. Chu. While many Rowan students seemed to like the showing, freshman musical theater major Gavin Dorval especially enjoyed it. The 2018 film is a romantic comedy in its own right. The movie offers its own spin at poking fun some Asian stereotypes and shows what it is like for someone like Rachel Chu, a Chinese American, who is wrongly treated for being “different.” Rachel was looked down upon by her boyfriend Nick’s Singaporean family for not growing up rich, being a product of an affair and for being raised in America. 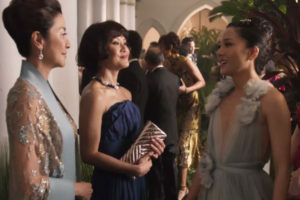 The film seemed to poke fun at Asian stereotypes by referencing “tiger moms” when the main character Rachel is surprised to see a stuffed tiger at Nick’s grandmother’s house. Another stereotype about Asians not being able to drive is referenced when the character Peik Lin Goh drove recklessly. “Rachel [was my favorite character], because I love [actress] Constance Wu so much,” Dorval said. Freshman musical theater major Gabrielle Hansson also took a similar outlook as Dorval. Hansson’s favorite character was also Rachel. “She’s beautiful, like crazy beautiful, and she was so smart, [and she] didn’t let herself break because of [her boyfriend Nick’s] family,” she said. Romantic comedies tend not to show what it might be like for the girlfriend or boyfriend entering their significant other’s family, but this movie also showed a mother letting go of her son and letting him be happy with the girl he loves. Eleanor Sung, Nick’s mother, believed Rachel was not good enough for him, but in the end, Nick’s mother gave him the ring that was made for Eleanor by her husband, signifying her blessing for Rachel’s and Nick’s relationship. Overall, Rowan students were pleased with the movie. The characters showed development and it had a light-hearted feel, with a tinge of romance. Every Tuesday, SUP holds a free movie screening in the Student Center at 9:15 p.m.